Expedition Egypt Tour October 2017! Announcing the Expedition Egypt Tour! Welcome! Thank you for your interest in the Expedition Egypt Tour! Those of you who have been following along with me for a while now know that a organizing a group trip to Egypt has been on my radar for years now. I can’t even begin to tell you how excited I am to finally make this happen and how amazing it’s going to be to take you guys along with me. I’ve spent the last few weeks fine tuning this custom built itinerary (below) that will show you some of the best sights and highlights that Egypt has to offer — from the streets of Cairo to the Pyramids of Giza, Temples of Luxor to a sunset sail on the Nile River, shopping at one of the most famous bazaars in the world and even a night of camping under the stars in the White Desert! 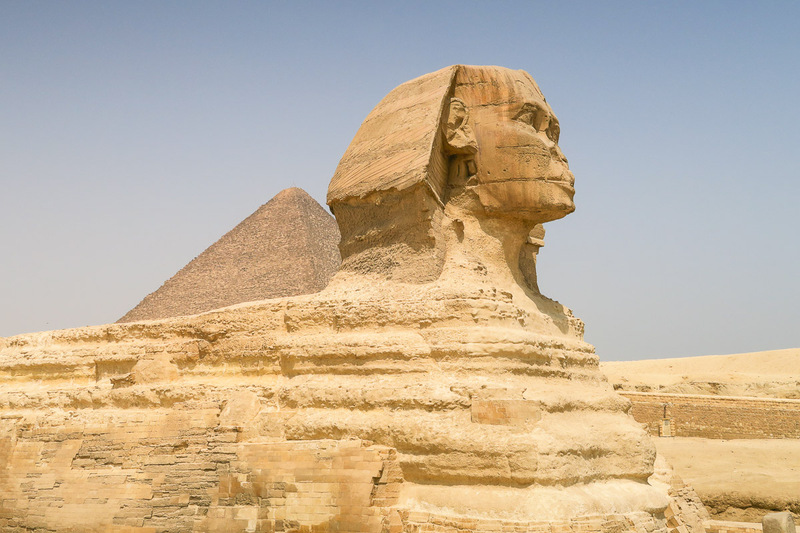 If you’ve ever dreamed of visiting Egypt then this is literally the opportunity of a lifetime! 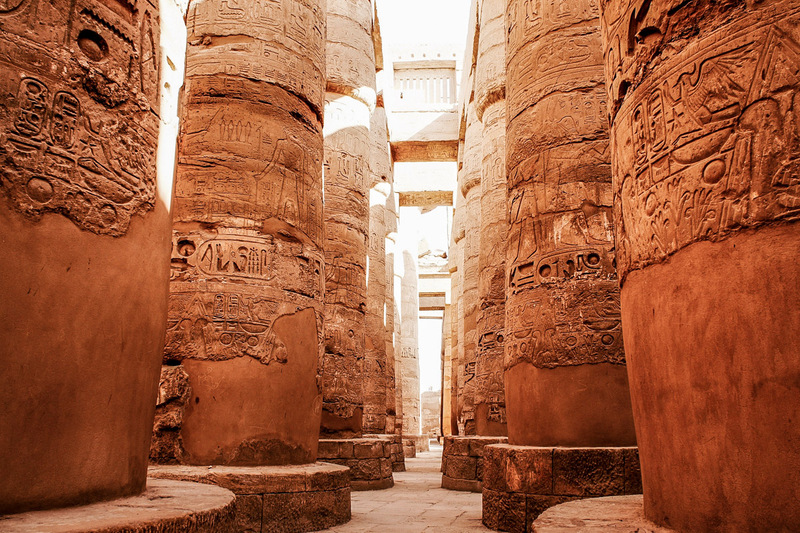 Expedition Egypt Tour (10/8 – 10/17) – Limited spots available – Register NOW! Expedition Egypt Tour (10/20 – 10/29) – Limited spots available! – Register NOW! Please note that this deeply discounted tour price (nearly a third of the normal cost of a tour of this kind) is exclusive to these first two tours only and will increase significantly the next time around. In other words be sure not to miss out on this incredible opportunity! Note: This tour is limited to 10 guests so please be sure to lock in your spot as soon as possible! 7 Day 8: Camping Under the Stars in the White Desert! Marhaba, welcome to Egypt and the start of the trip of a lifetime! Arrive in Cairo (airport transfer included). Check-in to the hotel and enjoy the afternoon at your leisure. In the evening we will enjoy a nice meet and greet dinner at a local restaurant in Cairo. Early start (8AM). We have a big first day ahead of us. 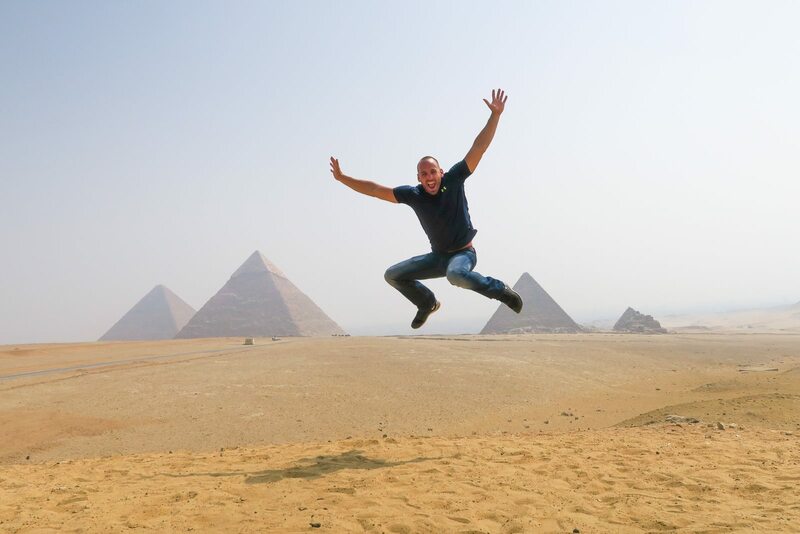 First stop: The Pyramids of Giza! After getting a closer look at the pyramids and the Sphinx we will enjoy a nice lunch nearby. Either by foot or by camel (optional). Later we travel to the Pyramids of Saqqara, to explore the myriad of tombs and temples at the site and see Zhoser’s step pyramid – constructed by Imhotep, the pharaoh’s chief architect in 2700 BC. Later there is time for dinner before traveling on the overnight sleeper train to Luxor. We arrive into Luxor around 7AM and begin to explore the east bank and we will visit the legendary temples of Karnak and Luxor. This is ancient Egypt at its best! After lunch we will check into our hotel and we should have a little free time before our sunset felucca ride to Banana Island. You can opt to fly over Luxor in a hot air balloon first thing this morning before we visit Luxor’s famous West Bank. 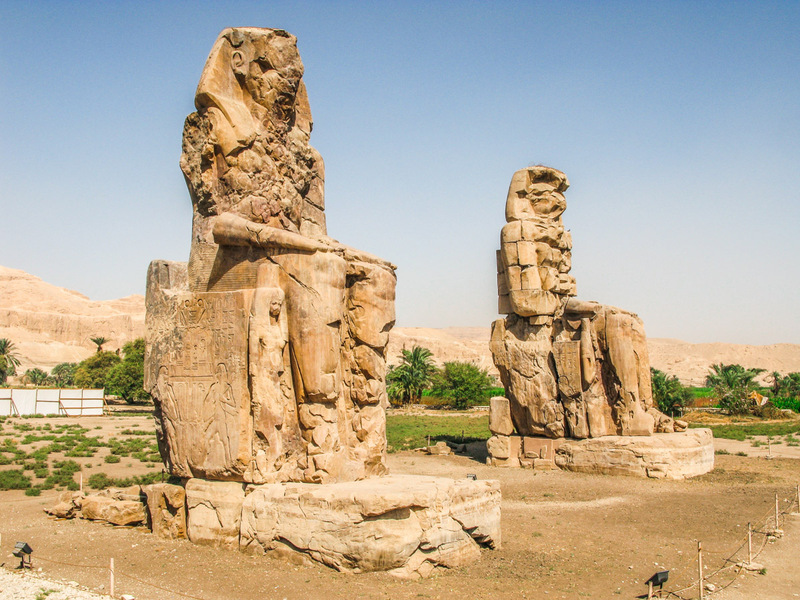 The twin seated statues known as the Colossi of Memnon will be the first site we’ll see before we visit the legendary Valleys of the Kings and the imposing limestone, colonnaded Temple of Hatshepsut. Hatshepsut was one of only 3 Egyptian ruling queens. The most famous tomb in the Valley of the Kings is that of the boy-King Tutankhamen (aka King Tut). Archaeologist Howard Carter discovered his intact and treasure -filled tomb in 1922. This will be a history filled day! In the evening we will have a nice low-key night out at a local bar/restaurant. Hurghada is one of the most popular destinations on the Red Sea. 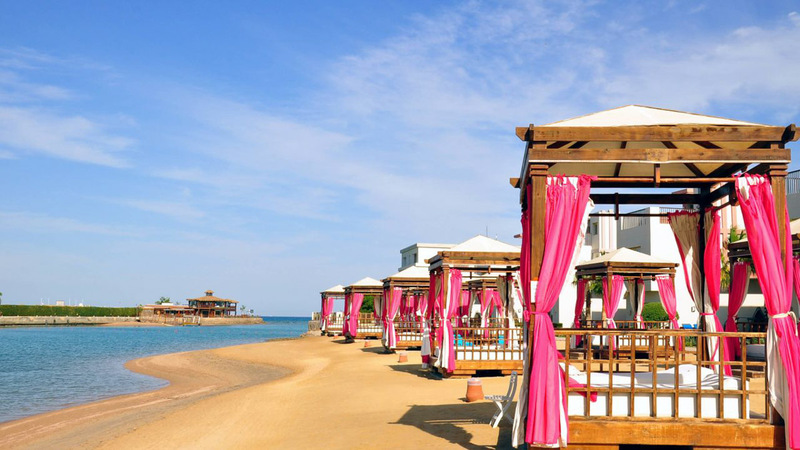 Hotels and expanded infrastructure provide vacationers with facilities for kiteboarding, yachting, deep-sea fishing, diving and snorkeling and Hurghada’s central location provides a gateway to prime offshore reefs, which are some of the finest in the world. Hurghada also has plenty of restaurants and late night bars for evening entertainment. Here, we’ll spend two days of fun in the sun at the 5-star Sun Rise Crystal Resort. Enjoy the pool, wander around the resort, book an optional tour. It’s all up to you. We will take you on a tour of the city and we will enjoy some of Hurghada’s nightlife. Optional Excursion: Trip to Giftun Island for swimming and snorkeling, which can be booked locally. After a leisurely breakfast we depart Hurghada and head back to Cairo. This evening we will visit Al-Azhar Park for sunset and follow it up with a dinner overlooking the Citadel in the distance. 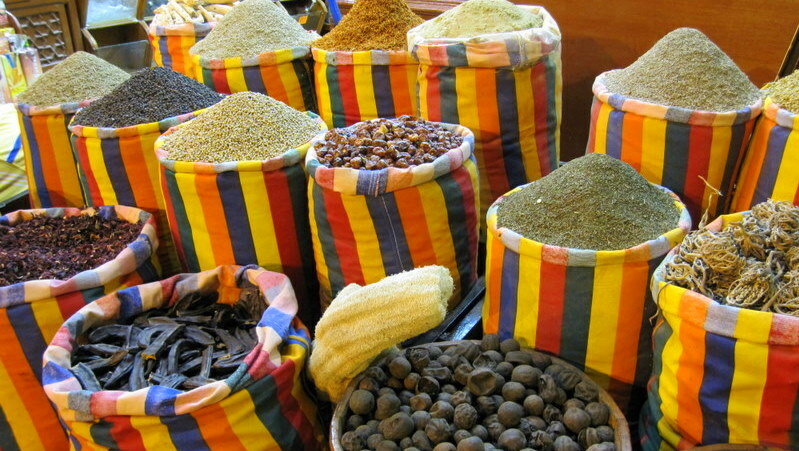 After filling our bellies we will make our way to Khan el-Khalili Bazaar — a giant open air market full of shops and maze like alleyways. This place is buzzing in the evenings! Here you can shop til’ you drop. If shopping isn’t your thing we can kick it at a cafe and enjoy some Egyptian tea and people watching. Day 8: Camping Under the Stars in the White Desert! 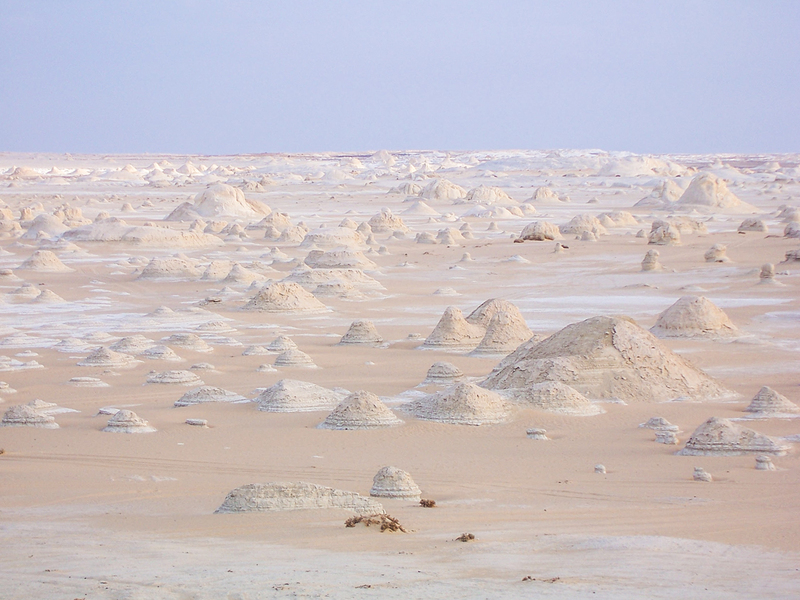 This morning we will make a trip out to the incredible White Desert. Here you will find some of the most amazing photo ops and we will get to catch the sunset in the desert before enjoying a delicious BBQ dinner and camping under the stars. The following morning we will wake up to catch sunrise, eat a quick breakfast and visit a natural hot spring (bring your bathing suit!) and then make our way back to Cairo. After breakfast we take a guided tour of the enlightening Egyptian Museum, where you can see the famed solid gold death mask of King Tutankhamen and opt to visit the Royal Mummy room. Spend the remaining hours of the afternoon and evening at leisure. 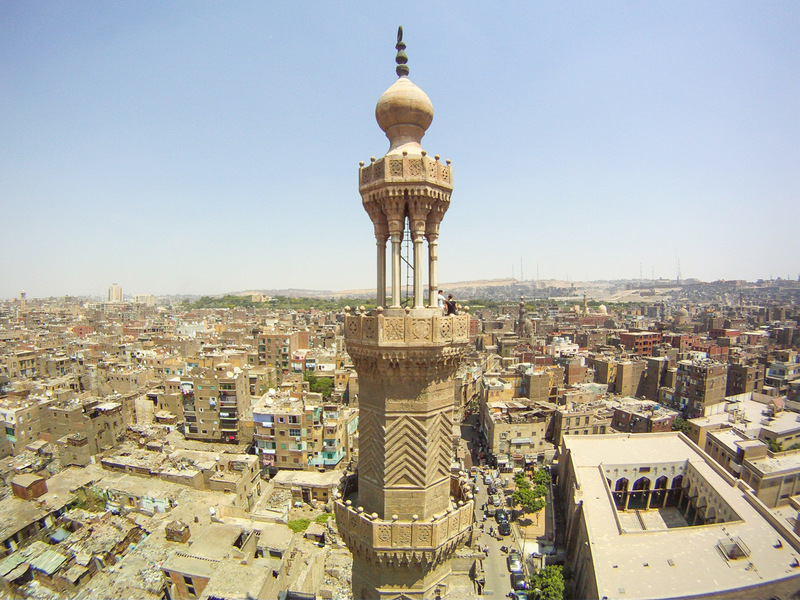 Alternatively, there’s an optional Cairo city tour available to book locally. Check out of your hotel and transfer to the Cairo International Airport (Transfer Included). October 8th-17th, 2017 – Limited spots available! – Register NOW! October 20th-29th – Limited spots available – Register NOW! Note: Prices are based on double occupancy (sharing a room with another guest who is traveling alone). I will do my best to pair up single travelers as best I can. Need your own private room throughout the trip? Please add $350 to the total cost of the trip. This tour will be limited to 10 guests — don’t miss out on this amazing opportunity! Please contact me here OR send me a msg me via Facebook for more information on how you can secure your spot today. Egypt is so under-rated – truly wonderful place to visit and not dangerous as people think! Excellent work. Keep it up.Truly motivating and worth getting a lot of fame. Good luck. Such a great place to visit i really wants to visit once thanks for sharig this great itinerary. All the ancient history makes Egypt’s cuisine what it is today, with each civilization leaving a mark on everyone must see Pyramid stone row.Egyptian Food Favorites Every Visitor Has To Try.